If initial impressions are anything to go by, then the Lobster Tail restaurant was off to a flying start. I was greeted with friendly smiles from the wait staff and the patrons that were leaving were grinning from ear to ear. The interior was nicely lit and there were plenty of booths to fit large parties. The walls were painted with a beautiful beach scene. By the time I sat at my table I was more than eager to indulge in what New England is known for; seafood. For an appetizer I ordered Large Sea Scallops wrapped in Smoked Bacon ($8.95). Very shortly afterwards I gazed upon six lightly browned scallops tucked comfortably in the smoked bacon. The plate was adorned with spinach leaves, as well as a spicy red pepper sauce. The scallops were incredibly soft and the bacon had a soft crunch to it. By themselves, they tasted rich and smooth, but together with the red pepper sauce, the flavors took on a more zesty bite. 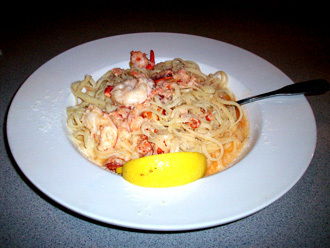 On the recommendation of my waiter, I ordered Lobster Scampi ($17.95). The presentation was excellent; a healthy portion of linguine, dotted with bright red chunks of lobster meat covered with a liberal helping of parmesan cheese. I could smell the butter and garlic as I twirled my fork into my dinner. The lobster was fresh and rich and the linguine el dente. The lobster bisque that lightly coated the pasta made this dish stand out. The portion was a perfect size, leaving me content and satisfied. I couldn’t have asked for a better dinner or service. The Lobster Tail is equally suited for a couple on a romantic date, or for the entire family. In addition to a comprehensive children’s menu, there is an extensive drink/wine selection for the adults in the group. The restaurant also sports an eat-in lounge area which is perfect for rooting on your favorite sports team as they play on the oversized televisions above the bar. 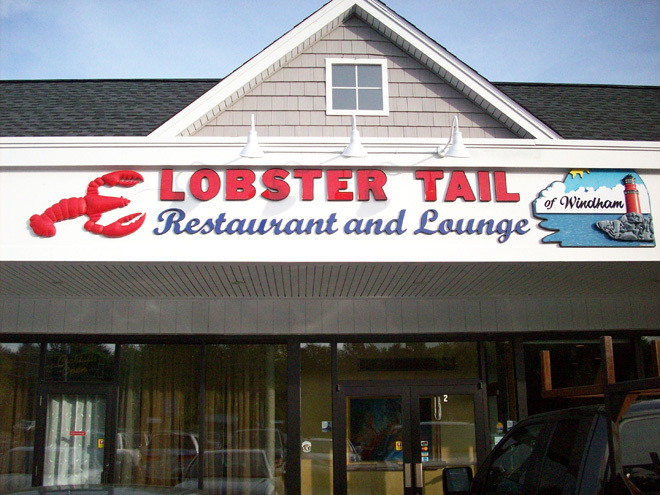 The Lobster Tail serves tasty New Hampshire seafood, and is highly recommend to those in the Windham area.